No Paper, Marking or Fussy Y-seams! Have you long admired Grandmother’s Flower Garden quilts but been reluctant to tackle all that hand piecing? 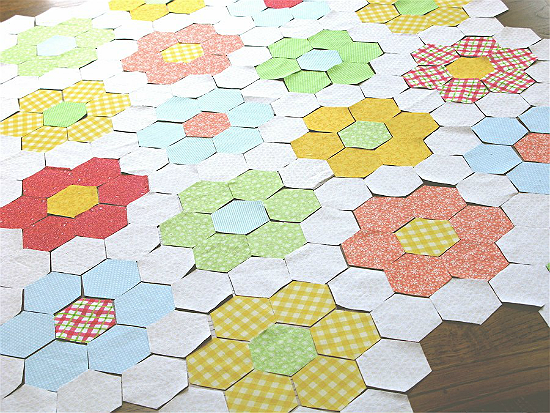 Traditionally, these blocks have been made by hand-basting fabric around paper templates, then sewing the hexies together by hand (or, more recently, by machine). Learn more about the history and traditional construction of these blocks here. Less time-consuming machine methods have been developed, but they require fussy Y-seams or cutting the hexies in half to avoid them. PatchPassion has developed a way of sewing hexagon patches together without any hand sewing, marking, Y-seams or fussy prep work. 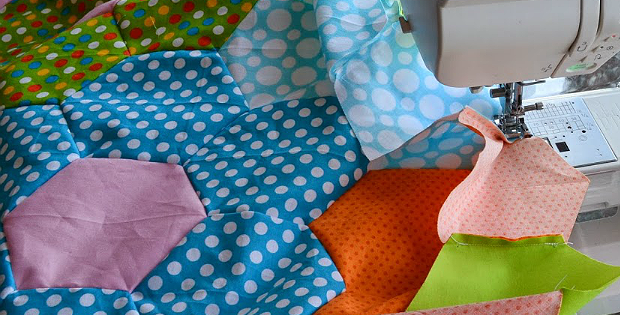 Her method is really quite ingenious, and opens up Grandmother’s Flower Garden quilts, and other hexie projects, to just about anyone. Watch how easy her method is in the following video. Once you understand how the process works you can easily expand the block with more rows, or tackle other hexie projects. Image Source: The photo at the top of the page is from Sew Fresh Quilts. This video is amazing! Thank you. This video is brilliant as I need to see a technique in order to understand it. This is fantastic. Will save a lot of time!